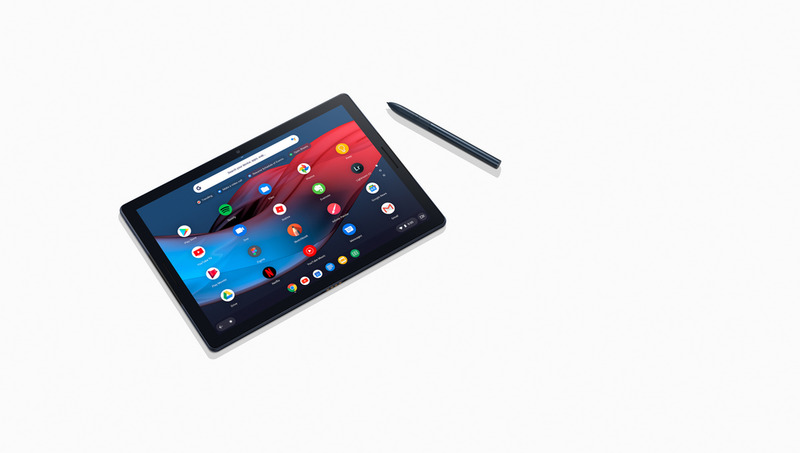 The Pixel Slate tablet bundled with Google Assistant became one of the newest members of the Made by Google hardware family earlier this fall as consumers got a uniquely designed device powered by Chrome OS packed with a long-lasting battery for getting work done on the go. It's Comfortably handheld : Weighing in at 1.6 lbs and 7 mm thin, it has a slim profile coupled with a curved glass which makes it easy to hold. It gives a state-of-the-art viewing and gaming experience thanks to the new Molecular Display feature that delivers a sharp picture paired with dual front firing speakers for the best experience. It helps get work done from anywhere with multitasking features like split screen and draggable tabs. An attachment of a keyboard, mouse and external monitor will get a familiar workstation experience with a fully capable desktop UI on the device which also makes use of machine learning for provision of app suggestions based on usage habits. The Pixel Slate is built with multiple layers of security, including the new Titan-C security chip to keep hardware tamper-resistant and information protected. Users will also get automatic security updates with Chrome OS once they come online. The Slate has a camera on both sides, one in the front for conversing with family and friends and another at the back for capturing of memorable photos and videos. There's a Google Assistant key on the Pixel Slate Keyboard enabling users to get instant help on the Assistant at any time. The Slate supports Google Play so users can get all their favorite Android apps, both online and offline for best use. The Slate Keyboard gives a laptop setup with backlit Hush Keys that enable for quiet typing. It can also be adjusted for use on a desk, entertainment mode and other various use cases, It makes for best use in many situations. The Pixelbook Pen can be used to jot down notes on the Slate screen while Google AI automatically transcribes the user's handwriting into typed notes. It works well with other devices with connection enabled for the Pixel phone for sending and receipt of texts and switching of screens. Instant WiFi tethering is also enabled for Both devices which make use of industry standard USB-C for charging purposes.